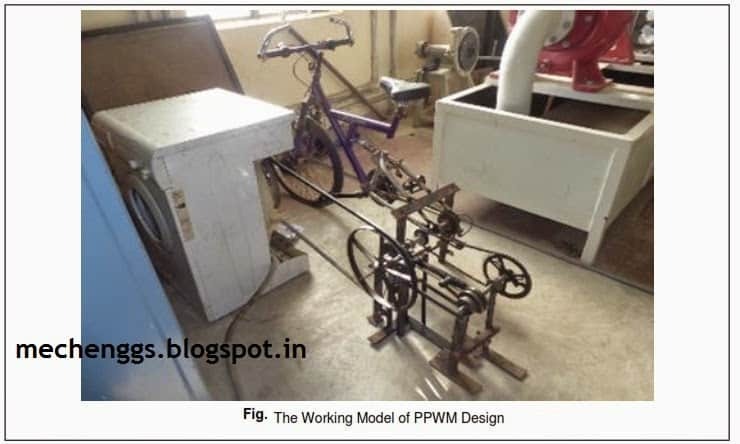 Pedal Powered Washing Machine (PPWM) is a low cost washing machine made up of easily and readily available scrap parts in daily life. It is a machine which generates power through human pedaling and with the drive mechanism, converts the pedaling motion into required rotary motion of the drum. Its innovation lies in its simple design, use of inexpensive parts, very low repairing and maintenance cost, affordability to each member of the society and it does not affect the environment. Our team intends to directly address the problems faced in washing clothes, and thus have developed a new design for easy effort in washing, rinsing and drying clothes. PPWM is a completely new concept, which in its one laundry cycle does washing, rinsing and drying of clothes similar to that of an automatic washing machine available in the market. 1) Provide a low cost machine. 2) A very effective machine which is not only cheap but has low maintenance cost. It should have readily available components and should be ergonomically efficient. 3) Wash any type of cloth. For the rinsing and spin dry the tub needs to rotate in one direction only. One of the important parameters for rinse and spin dry processes is the speed at which the tub rotates. Since there was no need for us to change the sense of rotation for rinsing and spin dry processes, it could be achieved simply by meshing of gears having the proper gear ratio. In the case of pedal powered washing machine, we required a reduction ratio of 2 for the spin and rinsing processes, so appropriate gears were made to mesh and the drive was finally sent to the tub to execute rotations at high speeds for the rinsing and spin dry processes. other position it meshes with the wash gear. Accordingly the tub rotates in the desired mode. Details of part design is explained in pdf file. 1. Eco friendly and non-polluting in every way. 3. The machine has low manufacturing cost. It is highly economical and affordable to all class of people. 5. Less tiring than conventional washing techniques by hand. This would greatly contribute in increasing the productivity of the manual laundries all over the world. 6. Lesser chances of failure than electronic washing machine as the mechanical systems used in the machine have stood the test the time. 7. More reliable: Due to simplicity of design the chances of failure are reduced drastically thus making the machine all the more reliable. 8. Lesser maintenance required: Maintenance of PPWM involves mostly lubricating the various parts which can be done even at home so maintenance cost are drastically cut down. 9. Zero operating cost: Since the machine is manually driven. 10. Very effective in protecting the hands of washer men from the harmful effects of the chemicals in the detergents. 11. It would help to reduce the physical stress which is applied on the hands during washing clothes. alternative way of washing clothes which is quick, cost effective and eco-friendly. The product designed has zero operating cost, cost-effective, and it can be used with minimal effort.